Real help you can use right now to run your business better! Audiences love hearing Vicki Suiter speak because she explains the critical steps to running their businesses better – then gives them the tools to help them do it. Attendees leave her presentations ready and able to make significant, positive changes. And, from the reports we receive back, they do! You’ve put in the hours. Hired the staff. Done everything you can think of to take your business to the next level. You’re working as hard as you can; but for some reason — and you don’t understand why — your business still isn’t making the profits you expect, and you can’t seem to get yourself untethered from the day to day minutia. What’s the problem? It’s really very simple. And the answer is simple, too. Like many obvious answers, this one is so elementary that most business owners fail to recognize it — until they reach the end of their patience, time, or money. In this eye-opening talk, Vicki Suiter identifies what lands business owners like you in overwhelm, and shows you the way out. She explains how to get clear about what’s holding your business back; and outlines specific actions you can take to create more powerful results, and stronger profits. Along the way, you’ll learn about the essential things every successful business owner does. And, you‘ll find out exactly how you can do those things, too. You’ll leave her presentation clear about what you need to do next; and convinced that it is absolutely possible for you to create more ease in your business and more joy in your life. 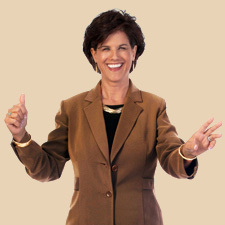 For over two decades Vicki Suiter has been helping business owners and managers gain more control over their businesses and their lives and create extraordinary results. Beyond offering tips and techniques, Vicki changes people’s view of what they’re capable of doing, and inspires their belief that they can attain results they’d never dreamed possible. Attend this presentation and be inspired! Thank you so much! This was incredible–such a clear and concise message with great practical insight and exercises! Loved your style and how you asked questions and asked attendees to share their goals and helped them to further refine those goals. Turn leads into sales and become the preferred provider EVERY time! When someone says they didn’t hire you because of price it’s probably not the real reason. The truth is, it has way more to do with perceived value and trust. A study by Rain Selling Strategies, found that building trust is one of 6 key drivers of what influences a consumers buying decision, and one of the top 10 things sales winners do. There’s no doubt that you work in a competitive industry, so how do you stand out from the competition, increase perceived value, build trust, AND make a profit? If you want to be the “provider-of-choice,” you need a clear strategy for controlling your sales process, controlling your relationship with clients, and ultimately, controlling your bottom line. How? Vicki Suiter will show you! As a business consultant and coach Vicki has spent over two decades helping businesses to be both competitive and profitable. In this talk she’ll share her strategies, skills and secrets. Learn the simple steps that will allow you to control the sales process. Get clear on how to gain your prospect’s interest and trust from the very start. Find out the secrets to becoming the preferred provider – even in a highly competitive environment. Know how to clearly communicate your value and turn your customers into raving fans. Find out how to bring value AND make the profits you desire! Turn your business into a money-making machine! Have you ever wondered why you don’t have more money in the bank when you’ve been working so hard? Would you like to have the clarity and confidence to know exactly what you could do to increase your bottom line, have more cash and work less? If it all that sounds too good to be true, let Vicki Suiter show you how you can make it your reality. For over two decades she has been helping business owners just like you make more money, have more free time, and ultimately enjoy their work more than ever before! In this talk Vicki will share her strategies, skills and secrets for keeping your prices up, costs down, manage a roster of happy clients, and build your bottom line — all at the same time! Learn which critical areas of focus will have the biggest impact on your bottom line. Discover what strategies successful business owner use to make a consistent profit. Get the straight scoop how cutting prices to stay competitive will destroy your business. Find out the single most important business practice that can transform your business and change your life. Do your conversations get you the results you want? If not, you may be managing the wrong thing! As a manager, do you find yourself saying…”People don’t do what they say they’ll do when they say they’ll do it!” or “My staff isn’t motivated,” or “I feel like people take advantage of my good nature?” If any of these sound familiar to you, you may be wasting valuable time on the wrong conversations! If you want to get people to do what they say they’ll do when they say they’ll do it, you must get agreement from people. That’s how you get results ─ and that’s the focus of this powerful talk! 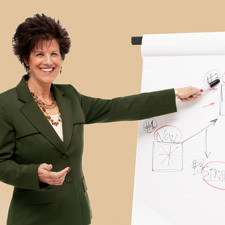 For more than two decades, National Speaker, Business Consultant and Coach Vicki Suiter has taught hundreds of business owners and managers how to inspire and motivate staff to produce consistent results ─ easily and effortlessly. The management system she teaches will help you realize positive, consistent results from everyone you deal with – from employees, to upper management, to clients. Using her cutting-edge system frees you from spending valuable time on micromanaging others and allows you to build a business where people want to work, and where everyone wins! Have honest, frank conversations with staff, clients and colleagues that build trust and lasting relationships. Learn to harness the power of your numbers! Do you avoid looking at your business’s financial results because you’re not sure what the numbers are really telling you? You’re not alone! Most small business owners don’t know how to read their financial reports, much less use them as a tool in running their business. As a result they—and you—are missing out on a powerful resource in managing your company. 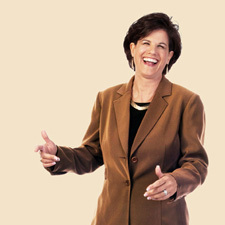 For over two decades Vicki Suiter has been teaching clients and audiences the simple steps to understanding and using their financial reports as a powerful management tool. “Numbers aren’t complicated once you know what to look for” Suiter says. She specializes in helping people gain clarity and confidence in reading their financial information, which ultimately helps them be more successful. Learn the most important key numbers to look at on your financial reports. Find out how to use that information to better manage your business. Understand what your balance sheet is telling you about the current and future health of your business. Get benchmarks to use for building a stronger and more profitable business. Start making money on every job! Bidding work without knowing for sure if you’re going to make a profit is a little like playing Russian roulette with your business. The result is a lot of stress, and not a lot of confidence. If there were a simple and clear way to bid work to ensure you always made a profit, would you want to learn how? For over two decades Vicki Suiter has been teaching contractors and designers the simple steps and strategies for bidding work to make a profit on every job. The results? Her clients have more confidence and clarity in their estimating and contract negotiations. Their close rates are up, and so are their profits. If you want to stop losing money on jobs, and consistently make the margins you should be making, then you’ll want to attend this presentation. Discover exactly how to bid jobs to make a profit – every time! Learn what mark-up percentage to use to cover overhead and make a profit. Find out simple ways of double-checking bids to ensure your numbers are right. Get clear on the items you always want to include in estimated costs. Get the inside scoop on what markups are “standard” for your competition. The secret to knowing what you want and getting it! Setting goals and achieving them are two very different things. There are key strategies for effective planning that, when applied in a particular sequence, will increase the likelihood of you reaching your goals much more consistently. If you want clarity about how to set and achieve extraordinary results, then you’ll want to attend this session. As a business consultant and coach Vicki has spent over two decades helping businesses achieve the kind of success they never dreamed possible. In this talk she’ll share her strategies, skills and secrets. Find out what causes most plans to fail and how to avoid the traps. Learn proven strategies to plan your success, and control the outcomes in your business. Get a powerful sequence for planning and discover how it can dramatically increase your effectiveness and the results you achieve. Know how to keep connected to your plan in ways that will empower and motivate you and your team.